This super beachfront villa offers beautiful views of East Bali's tranquil coastal area. Steps lead down to a private low-tide sandy beach with a coral reef directly in front of the villa. With a secluded private swimming pool, access to amazing snorkeling just meters away,a lovely garden and some warm service from our staff make our villa a great destination for families, friends and couples alike. Villa Anjani is fully serviced, and are staff are happy to prepare meals and serve you drinks throughout the day, The villa also has a fully equipped chef's kitchen and an outdoor dining area perfect for entertaining. We access the tranquil little Mendira beach by a short walk through the lovely little village or on a trail through me coconut plantations; it takes just 5 minutes to make the walk. Villa Anjani also has a private beach that appears at low tide, but there is a drop from the retaining seawall down to the sea of about 1.8 meters which is not fenced off - if this might be a concern we can always have a staff member watch over the children when they are at play. There are long piers on which to walk out on and adults and strong swimmers can find great fun here - or for youngsters I would suggest just a quick walk through the lovely village to Mendira Beach with is shallow and calm. Villa Anjani has 5 bright bedrooms and a lovely lounge that looks across the huge garden to the sea. Bedrooms comprise of 3 doubles and 2 twins - which can be made into double rooms. There are four rooms in the pool pavilion; the two rooms on the second floor share a shower & bathroom - *access to the sea-view master bedroom is through the first bedroom - a pool view twin. Two double rooms make up the lower floor - with pool view and sea view accordingly. Bedroom five is in the garden pavilion and is accessed by a spiral staircase. 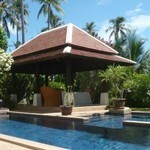 Villa Anjani has a large garden area and access to the sea by a few steps down to the the water. There is a small sandy beach which appears at low-tide and there is some amazing snorkeling just a few seconds away from the villa. Some of the most famous sites in Bali are close-by, including Besakih (the Balinese Mother temple); Teganan an original Bali Aga village and the water palaces of Ujung. There are also many more modern activities including; diving and snorkeling, rafting,submarine trips, the Bali safari park, elephant rides and trekking up the biggest volcano in Bali, Mount Agung. With Ubud an hour away and Kuta the same, Villa Anjani is a great place to base yourself for a trip to Bali. Situated in the small coastal village of Mendira, just before Candi Dasa on the East Coast of Bali, you will find a tranquil retreat in the middle of coconut groove. 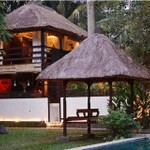 A super property Villa Anjani is a little piece of paradise set on a dreamy little low-tide beach. Be it sunrise or sunset it is all happen right in front of the villa. Traditional restaurants, tranquil spas and local shops are plenty in the surrounding area. From a 5 star experience to a friendly low budget "Warung" you wouldn't need to go faraway from the villa to experience the all around Balinese holiday. With the completion of the new carriageway, or bypass as the locals call it, from Denpasar, it is an hour and fifteen minutes from the airport. Perfectly situated in the Home of the Kings of Bali, the Regency of Karangasem, the village is overlooked by Mt Agung, Bali's most sacred and highest volcano. Exclusive use of the villa facilities and the services of the dedicated staff for the duration of your stay. Extra Persons Fee - GBP 20 / day - Per-Person Adjustment - Extra payment per person above standard 8 persons to cover our additional costs for food, laundry etc. Airport Transfer Fee - We can arrange transfers from the airport. Fees are payable upon arrival direct to the driver. Car & Driver Hire can be arranged with a 7 seater car or minivan with discounts for hires of over a week. Prices include insurance. Bookings of less than 4 nights are accepted if made within a month of arrival or at any advance time if they lie adjacent to an existing booking. All bookings require a deposit of at least 30% of the total amount due. The remainder is due 30 days before arrival. In the event that your date of travel is within 30 days, we will require payment of the full amount due to confirm the booking. We do not ask for a damage deposit from guests, however where breakages or damage occur at the villa due to the action of guests, accidental or otherwise, then we ask that you please report them to the villa manager so that we can rectify the damage as soon as possible and we do reserve the right to add the cost of replacement or repair of the item to the bill of the guest upon check out. For the avoidance of doubt breakage/damage includes, but is not limited to, permanent staining, cigarette burns, rips, scratches or other damage to furniture and soft furnishings. For cancellations made more than 6 months before arrival we will refund 100% of the amount paid, less a £50 administration fee, and any relevant bank charges or exchange rate differences where applicable. For cancellations made more than 3 months prior to arrival we will refund 50% of the amount paid, less a £50 administration fee, and all relevant bank charges and exchange rate differences where applicable. For any cancellation up until 2 months of arrival guests shall have the option of a refund (if eligible) to set the amount already paid against another stay with us within the next 12 months, provided such further stay is of a value of at least as much as the original booking. In the case where the proposed stay is of less value than the value of the original stay booked, then we reserve the right to pro-rate down the amount carried forward to the future booking accordingly (i.e. if the future booking is only of 40% of the value of the original booking, then only 40% of the amount already paid will be carried forward to be set against the future booking). Please note that we strongly recommend that you take out suitable travel insurance at the time of confirming your booking to protect you against cancellation.